I am going to write about how to get #CleanAirBeautifulHomes. As we all know, breathing in polluted air can lead to many diseases like chronic respiratory disease, lung cancer, heart disease, and even damage to the brain, nerves, liver, or kidneys. Continued exposure to air pollution affects the lungs ofchildren and may aggravate medical conditions in the elderly. Hence, air pollution adversely affects our health. We need to get rid of the pollution, but before that it is important to realize that polluted air is not an outdoor thing, infact it's alarming that indoor air can be 5 times more polluted than outdoors. It's time we make a move to make our air clean for our own health. Be it dust, skin particles, smoke or anything else, it all forms part of air pollution and takes a toll on our health. For cleaning the air indoors, we need to take care of even outdoor air as it enters the house as well. I am sharing some do's and don't's for keeping the air in your house clean and fresh. 1. Do not burn the garbage - It is very common to see people burning their household garbage in their backyard, however it is extremely wrong to do so. It not only creates smoke (carbon dioxide) but also this dirty air enters the house and the person burning the garbage is also affected while lighting up the garbage. 2. Don't hide odours - Many air freshners just hide odours, but you need to eliminate them to clean the air. Use a good air freshner that gets rid of bad odour instead of just covering it up. 3. Avoid use of pesticides - Do not use pesticides in your garden or at home as the particles of the same are carried by the air we breathe in our houses. 4. Do not smoke - Be it inside the house or outside, stop smoking as it not only damages your lungs but also pollutes the air. Smoking at home can cause passive smoking for other members of the family and also pollute the air indoors. 1. Clean the air of the surrounding - Take measures to clean the air of your surroundings by using carpool or electric vehicles, going cycling, walking etc. which reduces the creation of pollution in the environment. 2. Ensure proper ventilation - Proper ventilation in all the rooms and corners of your house is very important so that you can breathe fresh air. Air that is stale is not very good for health. 3. Use exhaust fans - Install exhaust fans in your kitchen, as cooking, cleaning, using hair spray, and polishing your nails can release many organic compounds which are harmful. 4. Get Asian Paints Royale Atmos - It is the paint that helps to purify the air with its activated carbon technology by reducing the harmful pollutants from the air. (Bonus, apart from the good looking paint on your walls). I am going to get Asian Paints Royale Atmos painted in my house and get rid of a #MaskedLife. Don't wait, take steps for your health and breathe pollution free air. I am here to share with you some good and healthy tips that I follow to stay fit without devoting much time to it as I have a busy day almost everyday. If you also face the same problem and want to stay fit, you have come to the right place. Read on to know how to keep yourself fit. I am going to tell you tips on how to stay fit inspite of having a busy schedule. Firstly, to stay fit it is important to work out. Now I cannot go to the gym going to my busy schedule and hence I try to do work at home myself manually which not only completes my household chores but also makes me fit by giving me the required exercises. The second thing you need to do is to stop being lazy. Psych your mind into doing work instead of procrastinating it and you will realise that you become more active than ever before. The third thing is you need to give up on junk food and start eating food that has the right oil which is healthy for you like Saffola Oil. Next, squeeze in few pushups or other exercises whenever you get few minutes, but remember to not exercise after a meal. Lastly, add a glass of honey and lemon water to your diet every morning which will wipe out the toxins from your body and help you stay fit. Push yourself to keep yourself fit and your heart healthy. I have shared tips on how I stay #ApneTareekeSeHealthy and hope you find them worth. I believe, everyone has a tough time following specific things so best idea is to define your own lifestyle keeping in mind your health and follow the practices that suit you best and the ones you can be comfortable with. When you don't follow a healthy diet, you start judging yourself sub-consciously, which is why it is important to follow a healthy routine. Don't let the negative thoughts of not following a healthy routine sink in, rather fight them out by following few easy steps to remain healthy and fit. We are all busy in our daily lives with our schedule and career, jobs, etc. But, I am sure we all do realize the importance of being healthy and go through the guilt of not making enough time and efforts for our health. Today I will share my ideas of being healthy by squeezing in a few habits into my daily schedule itself to stay fit. Now, there are two aspects to being healthy - one is to eat good and the other is to exercise. We annot overlook either of them. I plan to inculcate these two habits in my daily routine. 1. Take the stairs instead of the life whenever possible. 2. Go walking to short distances instead of taking your vehicle. 3. Include sprouts in your diet which provide you the nutrients for the day. 4. Use good cooking oil for preparing your meals like Saffola oil. 6. Make sure to drink lots of water as water eliminates the possibility of many diseases. Drink water while sitting, if you stand and drink water, it affects your knees in the long run. Simply follow these steps and make up for the carelessness you have being doing towards your health. Stay fit. I have shared tips on how I stay #ApneTareekeSeHealthy, share yours in the comments below. Ofcourse, you have to sacrifice a little on the junk food and other unhealthy practices, which will do a huge part in keeping you fit. So avoid junk food. “A grandparent is someone with silver in their hair and gold in their heart”, mine sure has! As grandparents' day is round the corner, i.e. 10th of September, it's time to #LoveJatao to them afterall not everyone is lucky to have grandparents. We all have been busy in our lives with careers, friends, jobs, etc. And we have also overlooked our grandparents. We barely find time to talk to them, visit them or even call them. 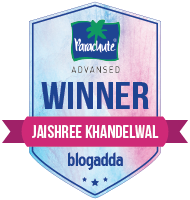 Thankfully, i have been following #LoveJatao for quite a while now. My maternal grandfather (Nanaji) suffered a paralysis attack earlier this year, and so I left my home and came to stay with him in his city. I have been staying year for quite a few months now. I take care of him, joke around with him, spend a lot of time with him, listen to his stories of his young days when he used to do a job. He is a retired Civil Engineer who served the Govt. I love the shine in his eyes when he talks about his office days and how he excelled in his work. We even listen to music together (After all, there is no better cure than love and music) and it amazes me how he can tell the name of the song, film and singer just by hearing the tune of the songs. Hats of to his memory. He has recovered a lot from the attack and now he can walk a few steps too, i wish to see him walking normally once again and I believe that day will come very soon. We even went through old pictures - He has a lot of photographs. Coming to grandparents' day, I am planning to celebrate this special day with my nanaji by cooking his favorite food and bringing milk cake for him as he loves it a lot. I have even ordered a shirt for my nanaji online, because celebrations are incomplete without a gift. We have 3-4 boys to look after nanaji so I have planned to call all of them as well and have a small treat with nanaji so he feels special and then I am thinking of spending some time talking with him. For me, it is grandparents' day everyday since I have been living with him, but still this day will be a little special for sure. Also, it is Nanaji's birthday on 15th September so, that calls for a celebration again and I am planning to prepare a birthday cake for him or order one from the market and make his 75th birthday a memorable one for him as well as me. Nanaji - My phone has just 44% battery. Me - Nanaji, check properly it is 89%. Here is a recent grandfie I clicked with him. Ganeshotsav is going on in full form, we all have welcomed Ganesha in our houses but, he will be leaving soon too, ofcourse with a promise to come back again next year! Goodbyes are painful isn’t it? But today I will share a positive side to goodbyes. Every year, during visarjan, we harm a lot of sea creatures due to the visarjan. Hence this year, Vodafone has introduced the concept of eco-ponds! 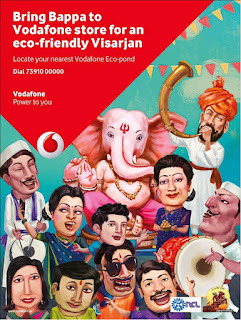 Well, Vodafone believes that while we celebrate our festivals with full enthusiasm and joy, we need to also think of sustainable life and hence, introduced eco ponds. What are these eco-ponds you ask? Eco ponds will help to avoid pollution that happens due to visarjan of Ganeshas made of PoP. The Eco-pond is technology driven and uses (IOT) device which helps track the water level in it once the Ganpati idol is immersed. The concerned family/Housing society/Organizing Committee also get a SMS alert. Vodafone team partnered with NCL and the latter provided them with a solution of ammonium carbonate that dissolves the idol and leaves the sludge, which can be later filtered and re-used to make chalks and other products. The brand teams studied on how much chemical solution would be needed to immerse Ganpati idols. The weighing machine also helps the NCL and Vodafone ascertain on how much chemical solution is needed to dissolve the idols once they are immersed in the pond. Once the pond is full, it is replaced with other pond and the first one would be cleaned and re-used. This year, as Ganesha will bid goodbye to us there will be a little #GoodinGoodbyes , all thanks to this wonderful concept. 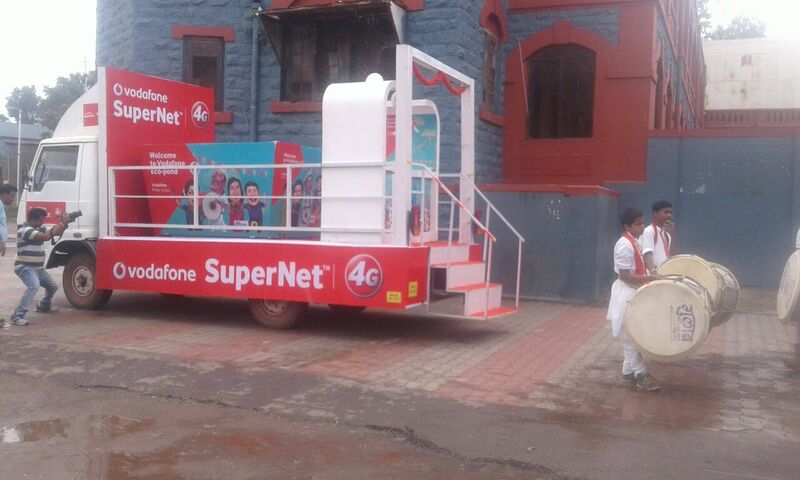 Vodafone has also set an Aarti stand as people perform puja before immersing the idol in the water. So, once they keep the idol on the Aarti stand, it will weigh the idol and then calculate on how much solution is needed to dissolve the total number of idols in the pond. Isn’t that an amazing step towards an eco friendly visarjan? I am really excited about this! I am glad to tell you that 8 Vodafone stores are dedicated to carry out the activity. Vodafone stores located at JM Road, Hirabaug, Wakdewadi, Aundh, Karve Road, NIBM Road, Kalyaninagar and Kharadi are equipped with Vodafone Eco-Ponds (See Annexure). 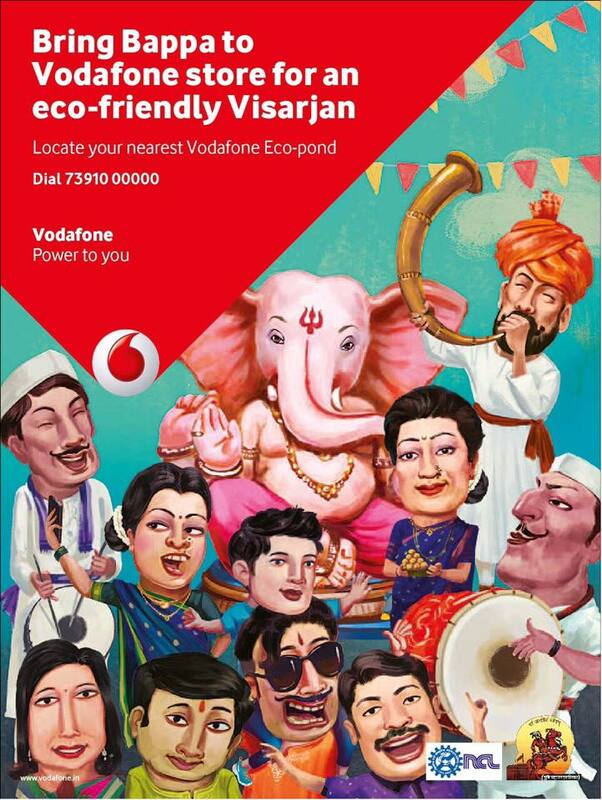 Further to this, devotees can also dial 7391000000 to locate all the Vodafone Eco-Ponds. 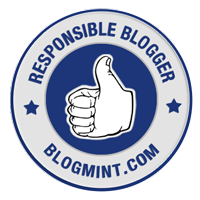 Go join the revolution for a sustainable future! !